... comprised: Chuck De Francis - guitar/lead vocals + Jim Kesilika - bass/vocals + Martin H. Samuel - drums/percussion + Chris Bovard - guitar/vocals. In addition to original songs by Chuck, the band played a mixture of blues, funk and rock. Artists covered were: Chuck Berry, Elvis Presley, Everly Brothers, Fats Domino, Sonny Boy Williamson, The Big Bopper, Jackson Browne, John Mayall's Bluesbreakers, Van Morrison and more. Although based on the windward side of Oahu, their first gig was the original Pirate Bully Hayes Place in Pearl City. The band also played at the Second Floor and the 23rd Step in Kailua and Undersea World, Hau'ula. 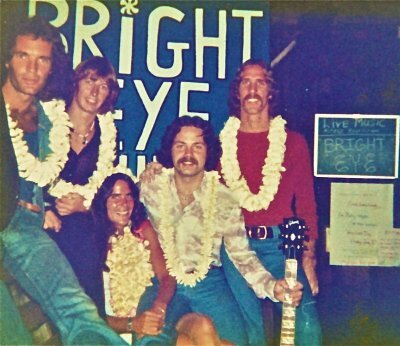 They jammed a funky version of Breezin' with Loyal Garner on her TV show and even gigged at the Outrigger Canoe Club, Waikiki. 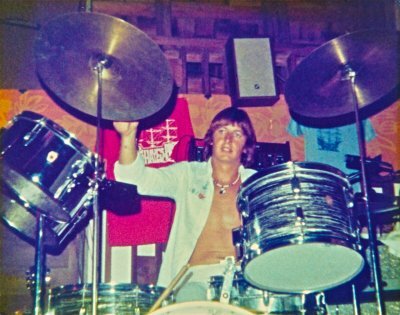 Invited by Randy Rarick, they were the featured band at the IPS 1977 World Surfing Champion awards ceremony, at Turtle Bay Resort on the North Shore, for Shaun Tomson [with whom Martin surfed Sunset Beach that same day]. 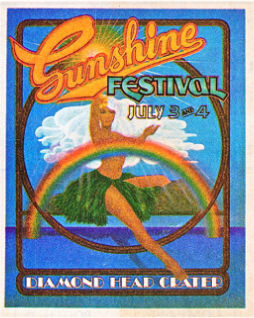 Bright Eye Band opened the 9th and most memorable Diamond Head Crater Sunshine Festival for Journey, Styx, Elvin Bishop, Flash Cadillac, Detective and the Mackey Feary Band on July 3rd & 4th, 1977. 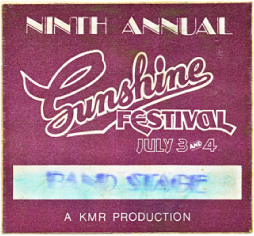 'A Beach'n Concert' was recorded at Kailua Beach Park on Sunday August 21st, 1977 ~ also playing were: Pinkerton's Foundry, Streethearts, Stryder, Syster and Woodrose.